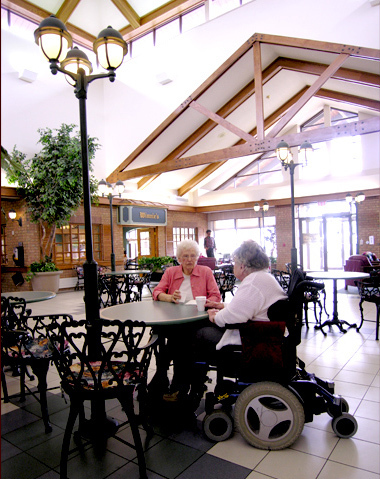 Schlegel Villages in Kitchener, Ontario operates eleven Schlegel Villages housing approximately 2500 seniors. Each Village has a Long Term Care component, with Full Service Retirement Living, Assisted Care, Memory Care and Independent Living options being added in stages. It is a model worth exploring. 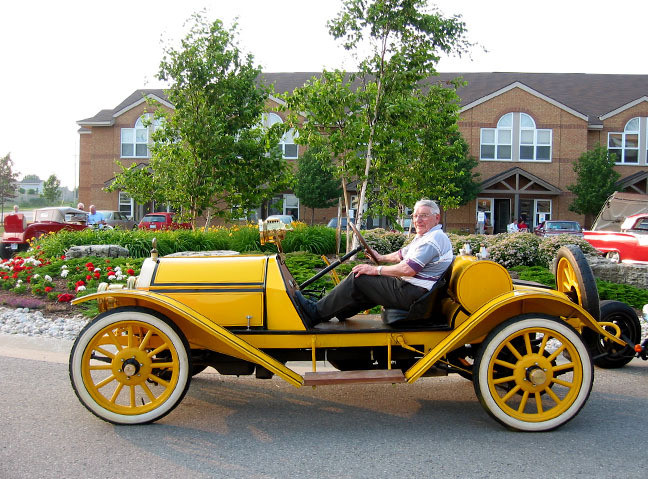 All of the Villages feature a hallmark design including a Town Square and Main Street to promote social interaction and quality of life, and to draw members of the surrounding community into the Village for events and activities. Design features across the internal Main Street create a look and feel of village living through awnings, “store fronts”, street signs, and extensive use of windows and skylights to bring natural light onto the street. The residential flavor extends to the exterior as well, with patio areas, sloping rooflines and beautiful landscaping. Staff development programs are regularly offered, including a 3-day leadership training program, specialized training in dementia care, wound care and complex physical care, and a 10-module series for Personal Care Aides entitled “Excellence in Resident-Centred Care”. All of their Villages are located in areas where senior-friendly community living surrounds the Village – close to churches, schools, parks, shopping, services, and easily accessed by public transit. Residents from the surrounding community participate in social, recreational and fitness programs along with residents living in the Village. Community groups are invited to hold meetings and events in the Village, at no cost and residents living in the Village are invited to participate. Schlegel provides a mix of programs to meet physical, social, psychological and spiritual needs. They embrace research and innovation through the Schlegel-UW Research Institute for Aging, which seeks to enhance seniors’ care through research and training. To accomplish this, they develop linkages and partnerships (a) to help develop new knowledge in caring for older adults as well as (b) continuous training opportunities for managers and staff. Residents and staff participate in research projects, building a culture of innovation and continuous quality improvement in each of the Villages. The RIA develops specific knowledge and learning tools to improve care and quality of life for residents and older adults everywhere. This arrangement benefits researchers by helping them develop relevant research programs and provides them access to research and development sites via Schlegel Villages. It benefits older adults by facilitating immediate translation of research to practice. And it benefits current and future staff through research-informed professional development programs and curriculum development for students interested in careers in seniors’ care. Schlegel embraces a social model of living rather than an institutional model of care. That is they emphasize living first. 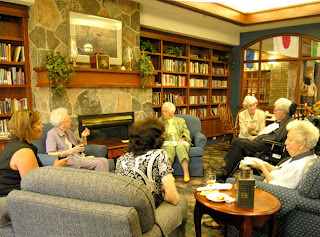 Each resident and staff member is part of the Village family. There are many tasks to be performed in a Long Term Care and Retirement Community, but they are not done just for the sake of getting them done. They are done in ways that engage and respect all members of the family, residents and staff alike. All of the staff are trained in this resident-centered approach. Schlegel Villages participate in the Residents First Quality Improvement Initiative. Ontario’s long-term care sector is increasingly focused on providing evidence-based care with accountable, transparent public reporting of results. Residents First helps homes gain new expertise and skills to meet their broader responsibilities and advance quality for all long-term care home residents. Through customized training in quality improvement (QI) science and practice, the Residents First initiative supports long-term care homes in Ontario in providing an environment for their residents that enhances their quality of life. It also facilitates comprehensive and lasting change by strengthening the sector’s capacity for quality improvement. In turn they are addressing some of the hot issues we face in this country: avoiding unnecessary emergency room transfers; preventing falls; preventing pressure ulcers; continence care; supporting continuity of relationship with residents. Their mission is sound: to provide holistic health care in a home environment, located within an internal neighborhood design that promotes a caring community, with emphasis on optimal health and life purpose for each Resident.